Today, many are looking to meditation for some peace and balance in their hectic and fast-paced lives. We are not the only ones being affected by the sheer speed of modern life. An increasing amount of children have been showing elevated signs of stress, restlessness, and anxiety starting at a very early age. The Journal of the American Academy of Child and Adolescent Psychiatry (JAACAP) published a study that showed an estimated two million more children in the U.S. were diagnosed with attention-deficit/hyperactivity disorder (ADHD) between 2003 and 2012 and one million more children were taking medication for it! What’s more concerning is – most of the diagnosis’ started before the age of six. A study done at the National Therapies Research Unit at the Royal Hospital for Women in Sydney Australia, showed significant improvements in ADHD symptoms with children who were taught to meditate. The children reportedly had improved attention spans and were less hyperactive. Other encouraging side effects listed were improved relationships with their parents and a better sense of self-esteem. Additionally, 50% of the children that were on medication either reduced or stopped their medication completely but still continued to improve their symptoms through a meditation practice. Here are some meditation techniques and tips (that have worked with my 3, 5, and 7-year-old). Exposing our children to these ancient techniques, could help them to cope better with stress, live healthier lives, and spread peace on earth! Children are prone to copying the behavior of their parents – so, lead by example. When your kids observe you in meditation, it sets a tone that children can learn to vibe with. When I am sitting in meditation in the morning, my children wake up and come sit quietly with me (either on my lap or nearby). This silence is mediation in itself – which brings me to the next technique. My kids and I have certain days dedicated to silence. Sometimes it only ends up being for half the day (or a couple of hours)- but, it’s a few hours of pure bliss! You can make it into a game – who can be the quietest? It should be fun for them (this isn’t meditation boot camp). This is a practice in mindfulness. I also suggest to them that when we do break the silence – the words that we speak should be ones of love, kindness, and good intent. Start Off Short and Simple. Many experts recommend one minute of meditation per year of age, starting at around age eight. I say, if our kids are being diagnosed with ADHD before the age of 6 – we need to start earlier. (Note: My daughter, who just turned 3, typically stays comfortably in mediation longer than her older siblings). Ujjayi (Victorious breath) – Explore practicing the “deep ocean sound” at the back of the throat ,while taking deep belly breaths. It truly calms and settles their energy. Kapalabhati (Shining breath) – They have fun watching their bellies as they push the air out of their mouths while drawing their abdomen in at the same time. There’s nothing like doing yoga as a family. Sun Salutations are a fun and a generally easy form of yoga to practice together. These 12 postures (or poses) are said to keep the nadis (energy channels of the body) open and flowing properly, preventing a host of diseases. Yoga is a moving meditation, the focus is on the practice itself, breathing, and the asanas (postures). Make sure they are breathing fluidly during the whole practice. Yoga asanas are traditionally a preparation for meditation. At the end of class, spend some good time lying in savasana. This is a great way to sneak in meditation because they are so physically tired from the workout, that lying down in stillness actually sounds like a good idea. Make time for your own yoga practice. This is a class for your kids, right? Going super deep into a pose can be challenging if your wee-ones are crawling through your legs while you’re in downward dog. The Gayatri manta has 24 syllables, each of which are connected to a different part of the brain. It has been used to enhance intelligence and intuition. It’s also a beautiful song and a great exercise for memory. Chakra Toning – Hang up a chart or painting of the chakras (the body’s seven major energy centers). Point to the chakra and have them imagine the color in that area of their body. Have them chant the mantra associated with that chakra. You can also just make similar sounds that the vowels make, as in- uh, ooo, oh, ah, eye, aye, and, eee. Inhale and stretch the sound for as long as you can on the exhale. Both variations work. Pop in a CD of your favorite mantra music and sing along. Bring in rattles and drums to create an in-home kirtan! After toning or using mantras, ask them to keep their eyes closed for a while and notice how they feel. This is a powerful meditation tool that can help kids gain awareness of the effects of using mantras (and hopefully get them hooked!). This is a great one as a bedtime routine. Yoga Nidra is an ancient practice that brings your awareness to different areas of the body while lying in stillness. I like to put a little tweak on it for kids and have them imagine magical golden pixie dust is being poured or sprinkled on different areas of the body. It’s great for body awareness and gives their minds something to focus on. It’s super relaxing and makes for great dreams! There are so many ways to incorporate meditation into your kids lives. Get creative. The main goal here is not to force your children to meditate, but to get them intrigued, and accustomed to it. Make it a fun and positive experience throughout their childhood, so they are more likely to keep it as a practice as they grow. Meditation is being prescribed more and more for a balanced, healthy, and happy life. So, instead of medication, try meditation to for your child’s wellbeing. I love this, I need to implement more of these practices in my home. We have tried listening to chants, and breathing but we need to do it more often! Thank you for sharing a comprehensive “check list” of sorts for those of us recovering from trauma in the family. Hello! my wife and I have a 0, 3, 5, and 7 year old, and peace is something that can be hard to come by in our house. One game that we play is to close our eyes, and see what we notice with our other senses. We listen for birds, feel the grass, etc. Something else I have found helpful is “Cosmic Kids Yoga” (http://www.cosmickids.com/) The gal tells a story that goes along with the poses, and makes it a lot of fun. Either way I think the best tip is your first one. Kids model what they see. If there is a behavior you would like to instill, practice it. Great point. I like having them close their eyes and use their other senses too. Like, listen for the furthest sounds (like birds), see what they smell (whether the scent of a tree or diffusing essential oil). Thanks for commenting! Oh, how I love this post and the important message we need to embrace. I certainly hope kids and meditation will be two words we will see together repeatedly and positively referenced in the near future. Many thanks! Thanks for your comment! I will be sharing more tips and tricks of how to get your kids to meditate soon! I am thrilled to read your blog and write up in the Chopra site! 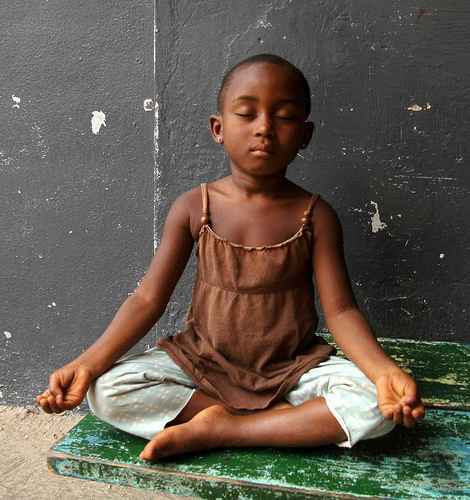 I have become very interested in teaching children to meditate. I have been practicing yoga for 10 years now and meditation for 3 years. I wish I had learned these techniques when i was younger, so now I am tarting to teach my grandchildren. Your article is perfect. I only see them at most once a week, so it will. Very slow process. I would love to share this with more children and hope to so in the near future. Thank you for your good words! Thank you so much for your kind words Karen! Glad it helps!